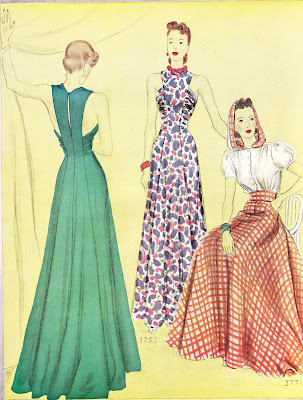 This week's fashion inspiration comes from the McCall's June 1940 magazine. Ah, June....Summer (sigh). I'm sure some of my Aussie friends are wishing for Winter! McCalls 3753 has been in mind ever since I first laid eyes on it. "Flowered taffeta or plain crepe--the formal gown is in both and is lovely in both. It has unusual lines, and it definitely does things for the figure. In fact one needs only to have good arms to wear a dress like this, for it fills out the bust, pulls in the waist--and hides collarbones and back." Though, I find it hard to concentrate on the beauty of McCalls 3753 with the hooded 3771 sitting in the corner! I always adore the hooded dresses. I need to find an occasion to make one! This is a fabulous dress! I've been coveting this pattern for a long time. Wish I could get my hands on one. Love the gowns from the 20's through the 40's.....Absolutely stunning!